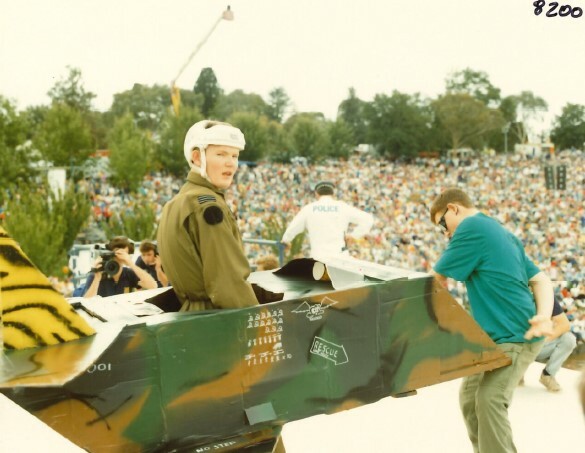 The Birdman Rally was one of the quirkier but very popular events held during the Canberra Festival from 1985 to 1992.The event was organised and broadcasted by local television station Capital 7 and was a leap of faith for a large cash prize. 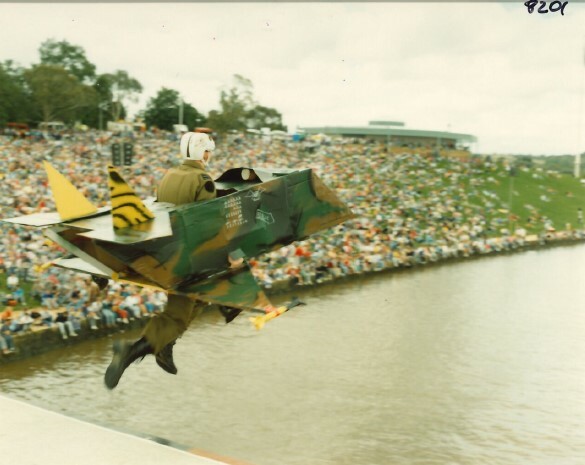 The six metre high launching platform on Regatta Point saw a myriad of entrants attempt to reach the 50 metre distance, flying in homemade machines ranging from cardboard boxes to full fibreglass framed gliders. 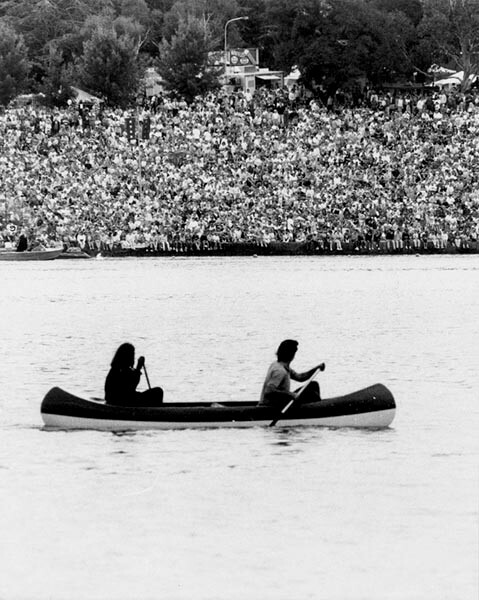 The rally was successful at attracting thousands of people to the shores of Lake Burley Griffin, while the Canberra Festival overall attracted numbers in excess of 150,000 during some of its most popular years. 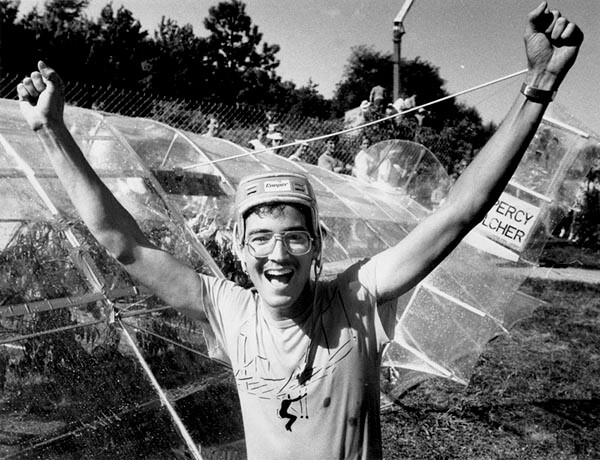 Images of Canberra’s Birdman Rally are the January Find of the Month. There was more to the being a Birdman than simply jumping off a tall platform. Weeks, or perhaps only minutes, were spent in creating a spectacular flying machine that could potentially go the distance. Spectators were amused by the variety of the crafts’ tongue-in-cheek designs, with some even made out of beer cartons. The crowd also got behind some of the more serious contenders who had spent hundreds of hours designing their craft and took a serious punt at reaching the grand prize. Some contenders tried their luck over consecutive years with improved versions of their previous crafts or with entirely new flying machines. Many of the contenders had noted the exhilaration of taking the daring plunge after spending a considerable effort making their craft. 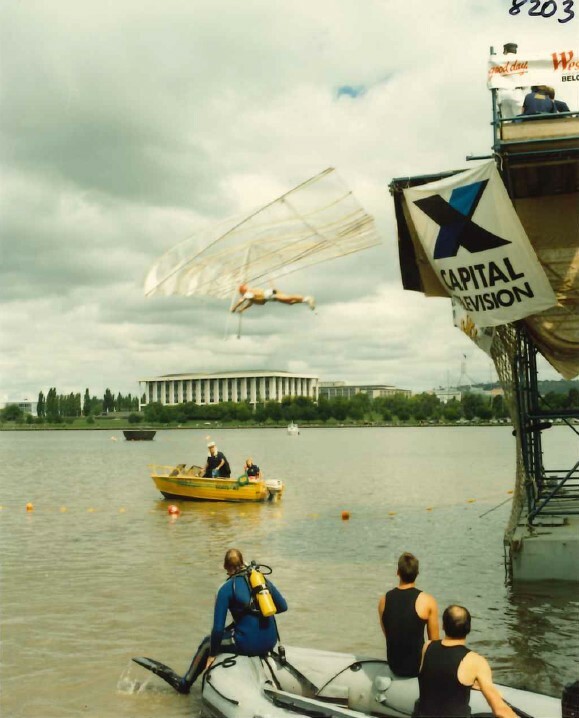 After hauling their creations to the top of the platform, contenders then braved the blue-green algae infested waters of Lake Burley Griffin with a running leap. The water’s temperature could be as low as 2 degrees Celsius below the surface, making for a chilly landing. ACT Water Police and ACT Emergency Services were on hand to rescue contenders from the water after their plummet from the platform, at times struggling to drag their homemade contraptions out of the water before the next contestant was due to take the plunge. The Birdman Rally formed part of the Canberra Festival, which was held over the Canberra Day weekend and incorporated a number of festivities. This included another popular gathering called the Food and Wine Frolic. Rally spectators would saunter over from the Frolic after a few hours of drinking and eating, with some even haphazardly participating after gaining some ‘Dutch courage’ at the Frolic beforehand. This mix of Frolic fun and water based activities would eventually cause some headaches for the Birdman Rally organisers. 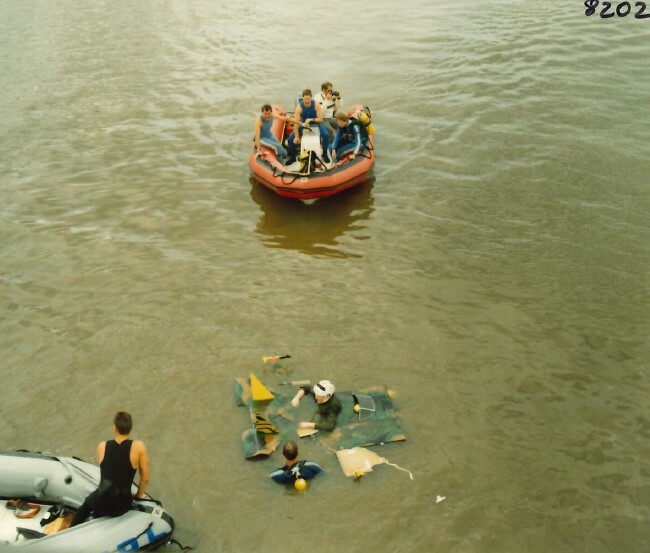 Recognised hazards were not just confined to land, with some spectators taking to watercraft to get the best seats in the house. Besides maintaining order on the shores and trying to quell revelry from the crowd, ACT Policing were also tasked with keeping the water faring onlookers from getting too close to the platform for the safety of the Birdmen. Scouts also volunteered to pick up any broken glass and empty bottles left by revellers during the day. Most entrants during the event’s short-lived history didn’t have much luck crossing the 50 metre threshold for the grand prize money. However, one contestant stood out among the rest becoming a firm crowd favourite. George Reekie and his dad Colin spent countless hours building and perfecting their flying machines for each Birdman Rally they entered. The pair participated in the competition as early as 1986 and were seriously in it to win it. After a number of attempts, in 1991 all their hard work paid off, with George finally crossing the 50 metre line and taking out the $20,000 grand prize. However, the victory came tainted in drama. Officials scrutinised the final result, deliberating whether the wing tips of the craft had scraped the water before the 50 metre mark. With the crowd growing restless, the prize money was eventually awarded to George. "I knew we could do it," said a jubilant George Reekie. "Conditions weren't the best, but we had spent 300 hours building it and it paid off. It's terrific; just great”. George went on to win the last ever Capital 7 Birdman Rally in 1992, winning a new Nissan Pulsar, that he would gift to his mother. George later used his 1991 prize money to move to the United States where he lived an eventful life as a successful industrial designer. He also met his future wife Keelin there and went on to raise a family of two daughters with her in Rhode Island. George passed away at the age of 50 in August 2017 after contracting an infection in hospital. 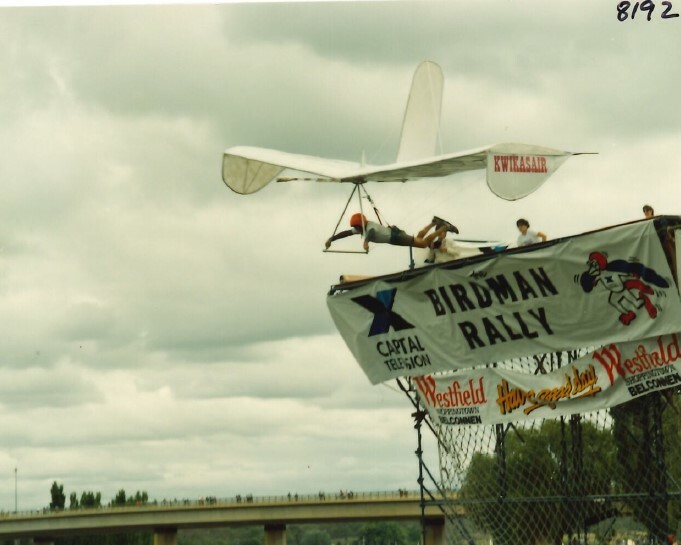 Sadly, the Birdman Rally would no longer remain a fixture of the Canberra Festival line up. Event organisers cited public liability and prize insurance as prohibitively expensive, meaning they could “no longer sustain the high costs of staging the event”. 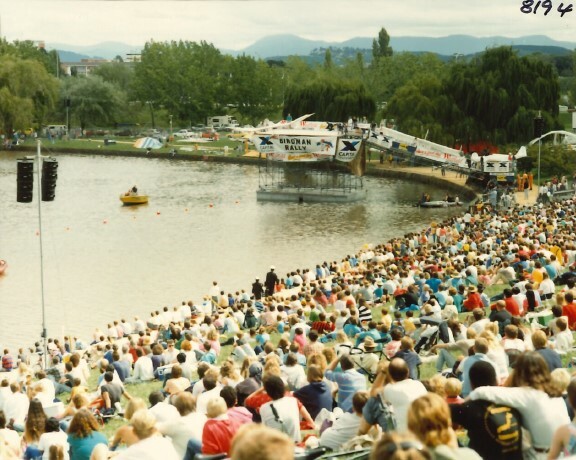 The Canberra Festival itself was held for the last time in 1994. George’s memory in Canberra lives on through calls for the resurrection of the Birdman Rally. An online petition was launched during 2017 calling for the return of this much loved event. 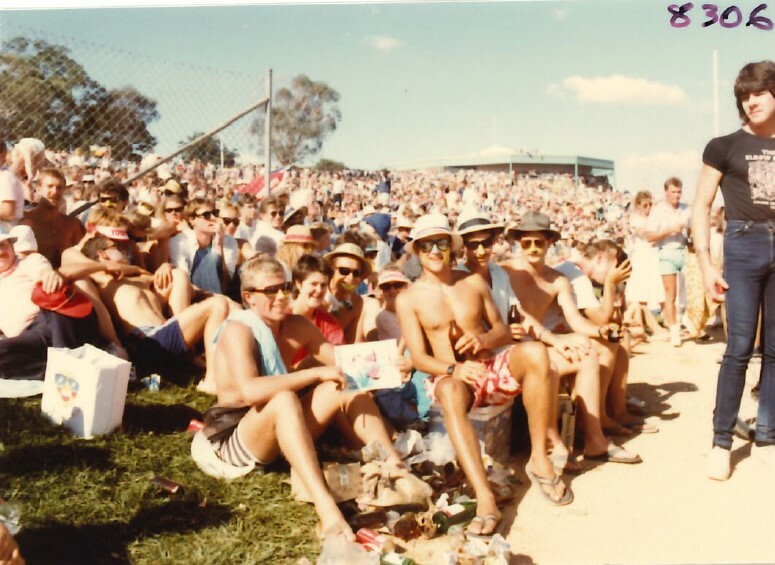 Online forums contain reminiscences from people who have fond memories of the Rally’s enthusiastic entrants and a spectacle that would go on to optimise the playful and quirky nature of Canberra’s event calendar. 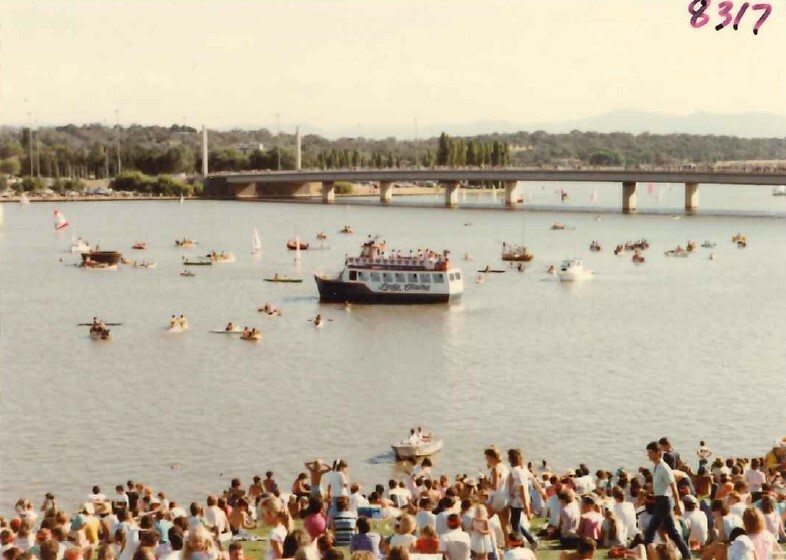 While the question remains of whether the Birdman Rally will ever take flight in Canberra again, these images of the Birdman Rally on Lake Burley Griffin still conjure found memories of an event that reflected the colour and frivolity of the eighties era. The competitors and their flying machines were just as full of character as the crowd, always brimming with pastel colours, mullets, bucket hats and oversized sun glasses. If you competed in any of the Birdman Rallies or have photos from any of the events, ArchivesACT would love to hear from you.